Is your business creating buzz through social marketing? By definition, social technologies have the ability to facilitate and drive word-of-mouth marketing campaigns. Random House, Dell, and Einstein Bros. Bagels are three companies that have strategically employed social technologies and increased customer engagement, brand awareness, and sales in the process. In 2007, Random House launched Random Buzzers as an online social platform to drive the sales of young adult titles and give new authors exposure. Since it’s initial launch, the site has become increasingly more interactive and launched a mobile site. The Random Buzzers community now has over 63,000 members that visit the site to discuss books, meet authors, and participate in online contests. The Random Buzzers site has a clean design that is fun to explore and feels a little like snooping in someone’s notebook. Random Buzzer members spend about twenty-five minutes or more on the site according to a July 2011 study by Affinitive. The study also found that 79% of members expressed intent to purchase titles from Random House. In a time when Facebook and Amazon dominate the social and retail spaces respectively, Random Buzzers fills a void for young adult readers. How does a big company like Dell listen to its customers? How can social response drive sales? If you attended South by Southwest (SXSW) this year in Austin, then you might have overheard something about Dell’s “Social Media Command Listening Center.” The Social Listening Center employs Radian6’s social monitoring platform that allows Dell to get real-time customer feedback, encourage conversations, and quickly respond to customer service issues. Dell’s popular @DellOutlet Twitter account gives you get the feeling that you are visiting a customer service desk rather than entering a crowded room (of over 1.5M followers). Want to ask a question about refurbished computer parts? Just ask Chris or Elise. The personal touch of the two employee’s names gives social customer service a much more human feel. On their product pages, Dell worked with Bazaarvoice to implement user ratings and reviews. According to Adam Brown, Executive Director of Social Media at Dell, user-generated content enhances the customer experience and has dramatically impacted Dell’s sales—nearly three-fold in Japan and by 138% in the U.S. (as of February 2, 2011). When Einstein Bros. Bagels decided to create a Facebook page a few years ago, they also set a few goals: increase their social fan base, encourage retail visits, and develop a new communication channel. According to a WOMMA case study, Einstein Bros. Bagels partnered with the social marketing company Context Optional to create a communication channel in a space where their target audience spends a significant amount of time. A glance at Einstein Bros. Bagels’ Facebook page today reveals a reach of over 676,000 users and growing. Moreover, the page has an active user base that posts pictures of their pets enjoying bagels, asks about upcoming deals, or replies to questions posted on the Wall. The screenshot below shows the user response to the question and promo message: Which bagel and shmear combination do you crave most – sweet or savory? Did you know you can get a FREE Bagel & Shmear with drink purchase just by joining our E-Club? 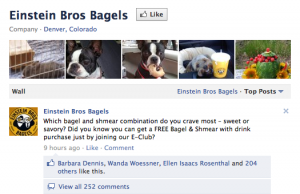 Einstein Bros. Bagels offers enticing coupons for new visitors to their Facebook page. If a visitor ‘Likes’ the page, then they will be eligible for the deal (if one is occurring at that time). Once this user likes the page, the word will spread to that user’s social network. For Einstein Bros. Bagels, one Facebook campaign resulted in over 250,000 new fans in a single day. It is dramatic results like these that are redefining word-of-mouth marketing. If it’s time for your business to become more social, then think about your target audience, unmet business goals, or areas for improvement. What single change could you make to your site to send a more compelling message, drive brand awareness, or create a more social space?